First, the cake had to include the perfect shade of emerald green (which tied back to her color scheme and bridesmaids dresses), and secondly, she wanted to be sure that all ingredients were healthy, natural, and gluten-free. As the owner of Perfect Fit Gym in Dublin, my client always does her best to incorporate a healthy-living methodology into all that she does, so her wedding day was no exception! After our initial meeting to discuss design aesthetic and alterations that we needed to make to the ingredient list, I then created a series of hand-sketches and corresponding quotes. 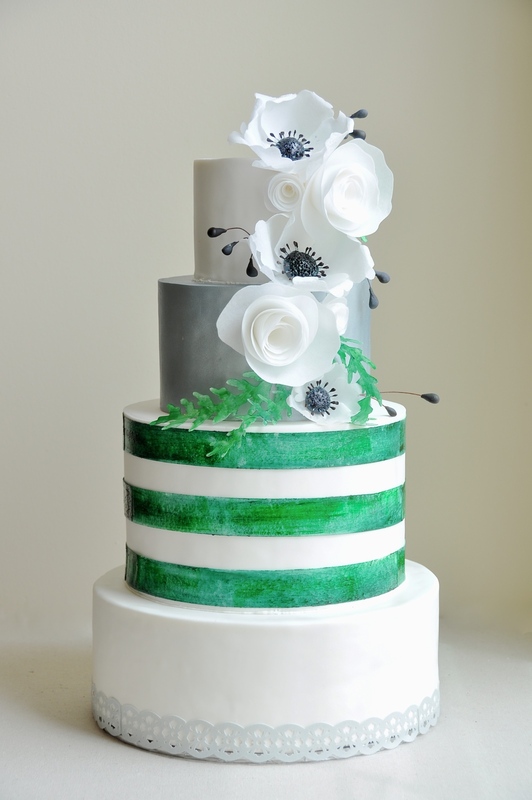 The bride and her hubby-to-be landed on one very special design… Bold hand-painted emerald green rugby stripes, handmade wafer-paper white poppies, roses and greenery, a hit of metallic silver at the second tier, and silver scalloped lace finishing the bottom edge of the cake. All details were edible, and all ingredients in the cake and icing were organic, natural and gluten-free. The cake was comprised of a gluten-free flour blend, organic cane sugar, cage-free organic eggs, organic buttermilk, organic butter, and all-natural organic vanilla extract. The icing was my simple buttercream recipe, which requires pure cane confectioners sugar (never beet sugar), organic butter, a splash of organic whipping cream and organic vanilla extract. 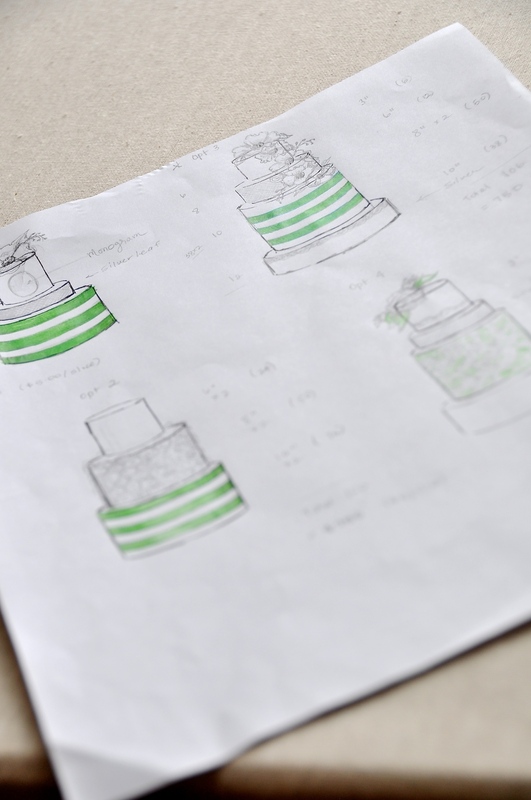 The exciting thing is this…even by taking the healthy approach; my client was able to achieve her perfect wedding cake design.... without sacrificing her healthy lifestyle choices in the process. That’s something to smile about. Wishing this blushing bride and groom a very happy (and healthy) life together!